I have always hated this part. We are currently in that mid-holiday bit of December. Slap bang in the middle of post-Christmas blues and NYE pre party planning. Not much really happens, if you’re like me, you might be receiving uni feedback left right and centre and constantly doubting you’re ability to perform as a student. But put those worries aside for now because I am here to present you with very very dodgy lit photographs from the puds and pastries I made on Christmas Day! You can understand why, surely. 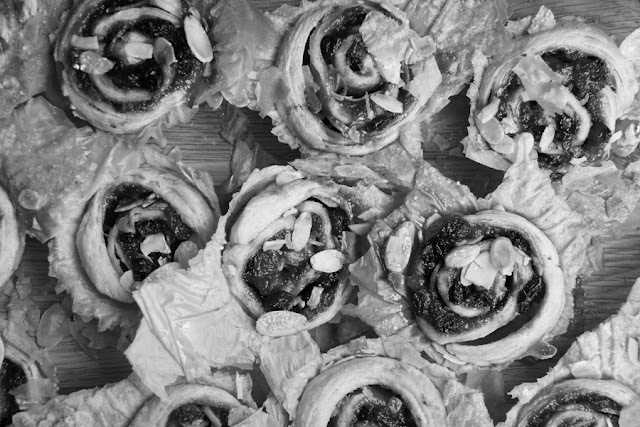 We had your not-so-traditional mince pies where the mincemeat was rolled into puff pastry, scattered with flaked almonds and bursting with rinds of clementine (thanks Jamie Oliver). Shortly after came your not-so-traditional Christmas pudding. Darling, it daren’t contain any pruned grapes! In fact, the only traditional feel our Christmas pud had was the fact that it was steamed – which is surprisingly simple to do by the way. It was a chocolate cake, shaped as a pudding (kind of) and prepared like a Devils Food. Atop lay the richest most decadently thick AND creamy chocolate sauce (thanks Nigella Lawson). PS. Click on the links above for both of these amaaaaaaaazing recipes. Em your purple cake stand is gorgeous! As is the cake on top of it! 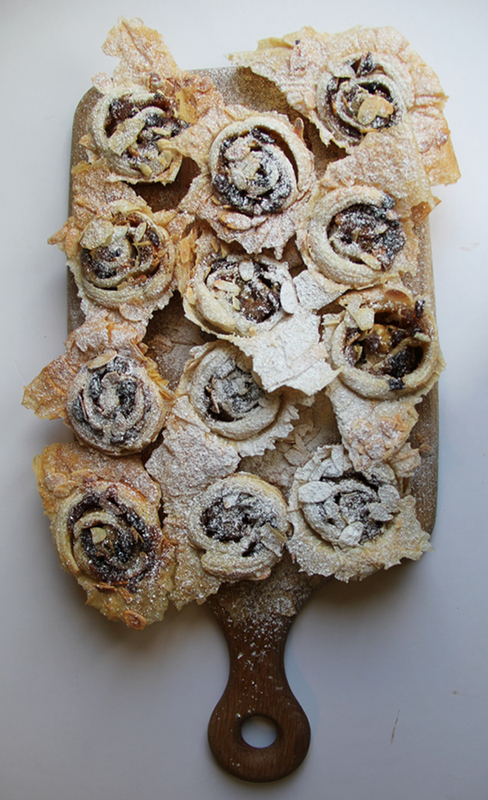 My other half would love the mince pies, they look so lovely and rustic. Becs - I know exactly what you mean, I like to scoop the weird grapes out and just eat the sticky sauce stuff, that goes perfectly with the puff/filo pastry :) Same, have the most perfect new year will you! TCH - I never felt satisfied in the amount I consumed over Christmas also! I'm pretty sure I still have room for more! Also, keep a look at in supermarkets, you always get the odd mince pie dotted around :) Have a lovely new year! Those mince pies look great! 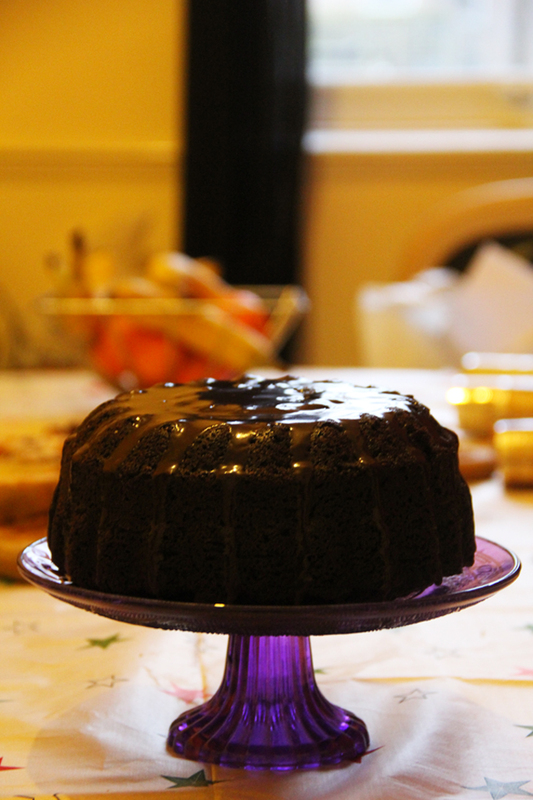 And the chocolate cake looks delicious too :) I know what you mean about the time between Christmas and New Year. I did a bit of sale shopping and went to York for the day.